There has been much talk this season about “double denim”. To begin with, I was not sure what it meant. On investigation, I discovered that it simply means wearing two items of clothing made of denim cloth. Would you or wouldn’t you wear double denim? This is definitely a look that is likely to divide opinion. Old cowboy movies may come to mind. Not very feminine; however times change and it is now apparently “a la mode”! There are many areas that need to be considered if you want to experiment with this look. Should the denim match or contrast? If you match or closely match you will gain the illusion of height; however, if you pair a dark denim jacket with white jeans unless you are tall, it may create too much of a dividing line, thus reducing your height. I needed a new denim jacket as my old one was past its sell-by date. These days I prefer a jacket that covers the hips, so I did not want to buy a classic style. It took me ages to find the belted denim jacket I am wearing above. I tried this more classic style first but somehow it looked too big on me and not in a good way. It would probaply work well if you had wider shoulders. I prefer the softer fabric of the one I am wearing and the V neckline and looser shape I found more flattering. Lilac scarf from St.Tropez market. If you choose to wear two pieces of denim together I think that it is important to have an accent colour to lift the outfit. 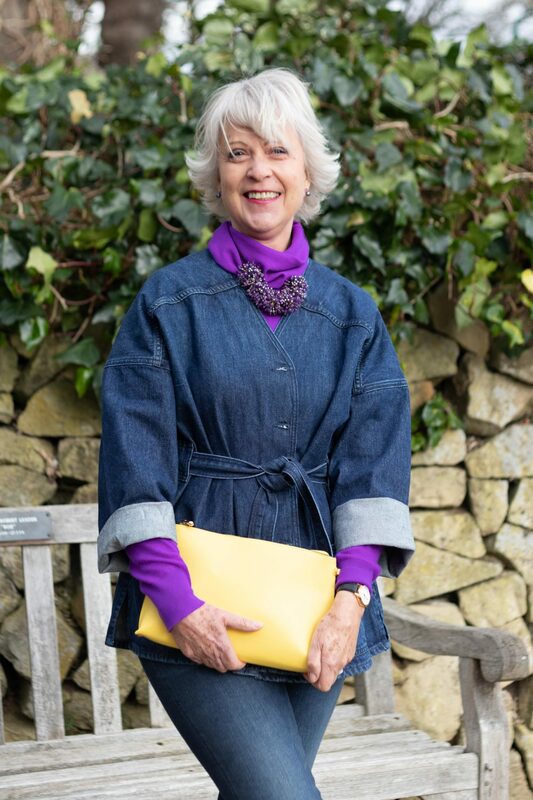 Here I have added my purple WinserLondon sweater, a statement necklace from MarksandSpencer, they do some great costume jewellery at very reasonable prices, and a bright yellow clutch bag. I have every intention of teaming my new denim jacket with a pair of white jeans when I have found a pair to replace my old ones. Clutch bag old similar. Well, what do you think of my experiment? It is OK if you don’t like it I know it may not be to everybody’s taste. However, if we never try a new look we will never know if it suits us or not. I actually came to like the look and will be wearing it again. 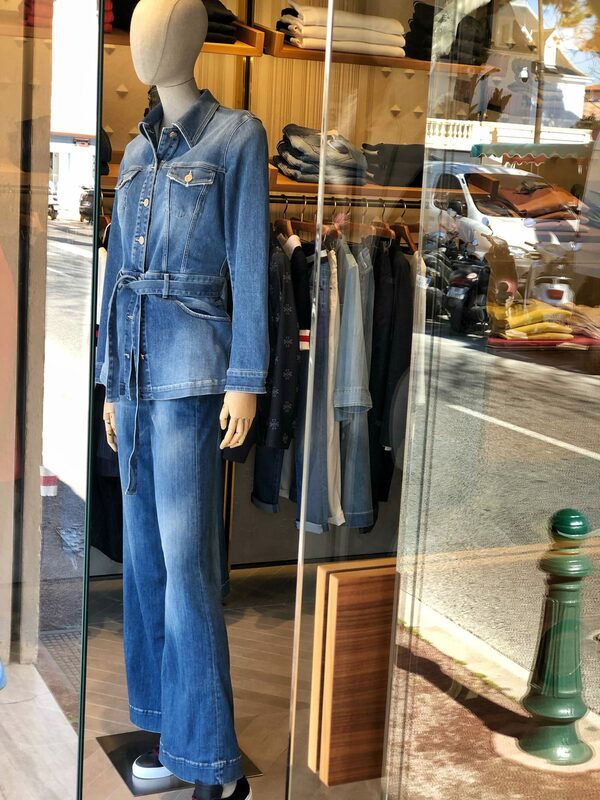 During my visit to St.Tropez market guess what I saw in the window of one of the posh boutiques. Yes, double denim. So maybe the chic French women will be embracing this look. I don’t like the same colour denim look but you look fabulous he way you styled it, but then you always look stylish, you could wear a bin liner and look good. I have got a fuchsia denim jacket which I love and which doesn’t look too workman-like. Thanks for the compliment. I could experiment with a bin liner would need a belt however black is not my best colour! Lol, a coloured bin liner then. Love the humour. I’ve just never been a fan of any kind of denim. yes, I do wear jeans! But I only own one pair (Ann Taylor Loft) of real denim color. White, yes, any time. So a denim jacket would just not be my style. That said, you look great in this, and I totally agree with a nice spot of color! Double denim used to be called a Canadian tuxedo (I’m originally from Canada so I can say that without being offensive I hope!). You look great in how you have made the look very stylish. I haven’t owned a denim jacket for years but may look for a white one to wear with skirts/dresses in the summer. Thanks for the information I had never heard of denim being referred to as a Canadian tuxedo. Agree with above comments. Sadly, I don’t look like you, Josephine! I do have bootleg denims(indigo) and in white. Hate myself in any form of denim jacket. I find that &otherstories sizes come up quite large. I bought a 38 which I think seems to be a generous 10. You would probably be a 40 or 42. I often buy two sizes and send one back. Most stores offer free returns and it saves on postage. How lovely the way you’ve put the double denim together, thank you for going to the trouble of showing us yet another new look and you are gorgeous as ever. The only way I can ever bring myself to do double denim is if its in different colours. I have an off white cropped denim jacket I wear with both my blue and grey jeans. Having said that, you look great in the photos. I say if it looks good wear it. Double, triple, who cares. You look great in that outfit. Like your comment about having an accent. Since I’m in the USA I don’t think I can purchase some of the denim you showcase. Looking good! I have a very old denim jacket that is longer but it has a dark/light denim pattern and I love it…now I wish it didn’t have the pattern because I would have been able to wear it this year! Love your blog and your common sense. You could try it patterns are quite in this year. Perfect timing ! Today I purchased two pairs of denim jeans, the first in years, I only use an old pair for gardening. A treat for my 80th B/D this week, and as I passed the over 80 driving test. I did have a jean jacket (or Canadian tuxedo) complete with a detachable fur collar (!!) Now you have given me lots of choices. Will shop this weekend. Thank you, Josephine. I think it totally depends on the individual pieces that are put together but I think you look super great Josephine. I have a denim jacket I’ve had for about 20 years. I probably should get it out and experiment. I also have black denim and navy denim jackets but they are a tad too tight for me right now. Lol. 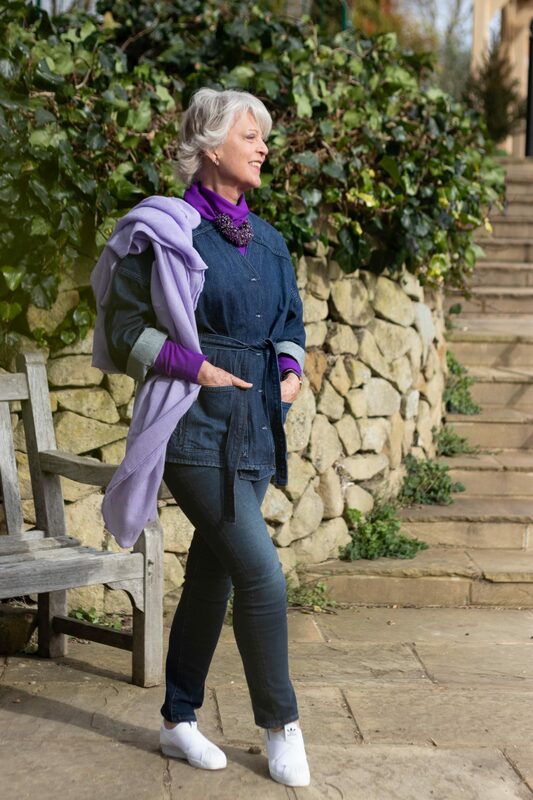 Since I stopped having to wear more corporate clothes every day my every day wardrobe has gradually reverted to many of the items I wore as “youth” including lots of denim, jeans, shirts, jackets and even a Toast denim dress. 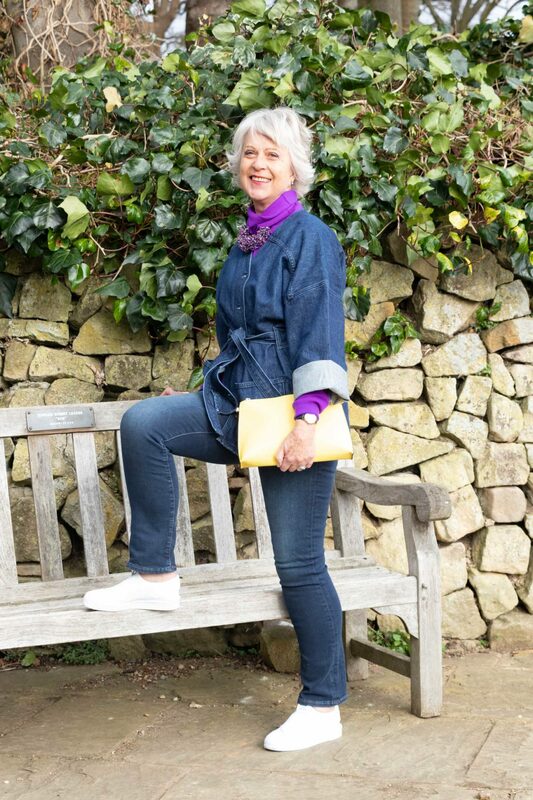 Now it looks like my favourite late 1970s ensemble of indigo denim shirt and jeans has come back round the fashion circle, hooray!